I'm always amazed to meet people who live in Los Angeles who have never attended the Rose Parade in person. Huh? Sort of like living in L.A. - but only having seen the beach on T.V. I came across some photos I took nine years ago at the 2003 Rose Parade - I decided to post them for old times sake. We were living in Arizona at the time, but our work took us to San Diego between Dec 27-Jan 1. We literally drove up at 6am New Years' Day from San Diego to Pasadena, enjoyed the Parade, had lunch with friends, and then drove back to Arizona. The five years we lived in L.A., it was just an easy, traffic-free drive over to Pasadena. Now that we're no longer living in L.A., it's been a lot harder to get to Pasadena. This will be the second year in a row that we won't be able to see it in person. Watching it on T.V. is "just OK" . . . it's one of those things that's just so much better live. My first experience going to the parade wasn't very good - and I said I'd never go back. Then a friend suggested we show up towards the end of the parade around 9:30am. We found good spots just as the parade turns off of Colorado Blvd onto Sierra Madre Blvd. 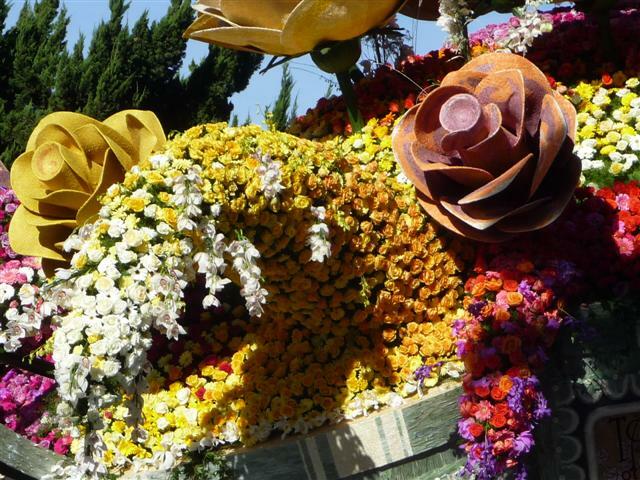 Sierra Madre Blvd. 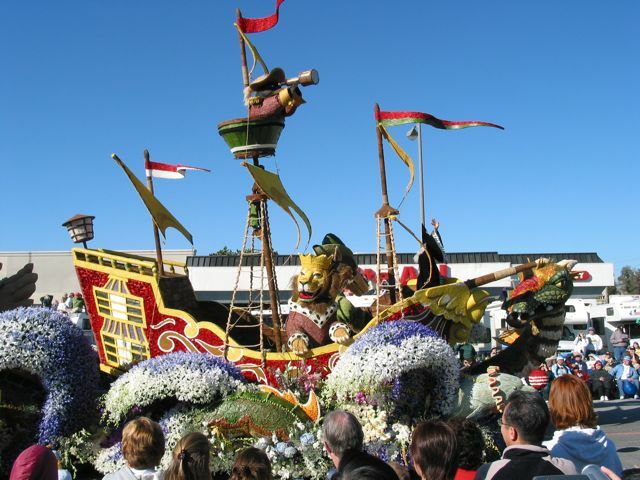 is a great - in my opinion the best - place to view the Parade. There's plenty of free parking in the neighborhoods (but be prepared to walk several blocks). You can show up around 8:30am and still find a good spot to view it. Another tip: bring chairs. 2003, the year I took these photos, was the only year we forgot to bring something to sit or stand on. Every other year we brought a couple of light-weight plastic chairs. We made sure we wouldn't block anyone else's view - and this allowed us to stand up now and then to grab an unobstructed view. 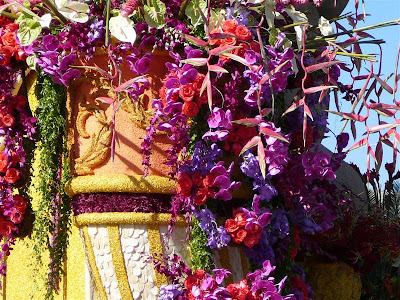 One of the distinctions of the Rose Parade is that every single surface on every float must be covered with flowers or other natural materials. 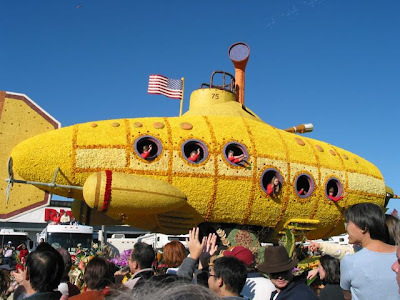 It's really incredible what the float designers can accomplish. As I shared previously in a similar post, with everything going on in the world (war, famine, natural disasters, civil conflicts, etc.) 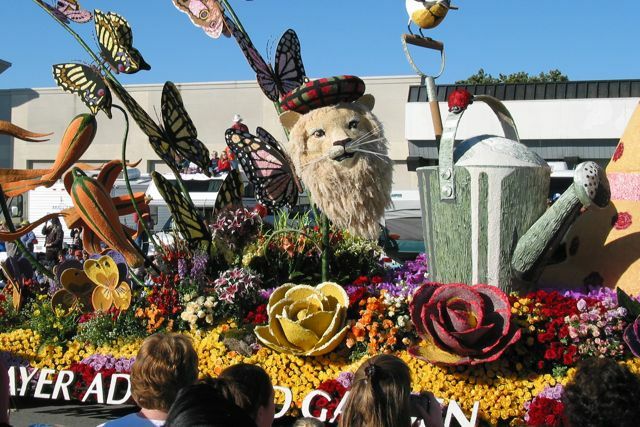 is it trivial for me to even wonder what God thinks about the Rose Parade? Or, perhaps, better, what does God think about flowers? What does He think of His creation? I remember a friend who's a professor at California State University, Northridge stating: "a clearer view of the creation gives us a clearer view of the Creator." Theologians call this natural revelation. 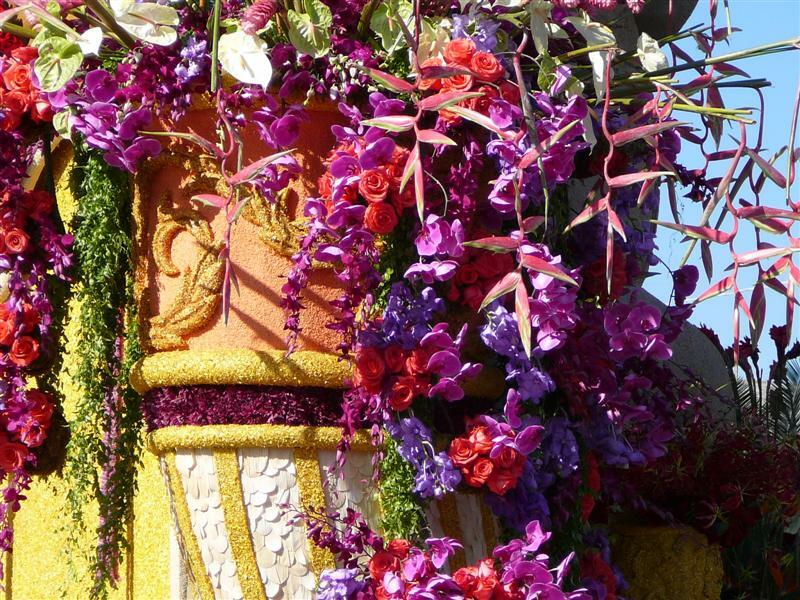 There are many reasons why I like taking my family to the Rose Parade, but one reason is to enjoy the magnificance, variety, and splendor of God's creation. Not to disengage with the serious problems of the world, but to put them in perspective, at least for a few hours. I honestly find the Rose Parade as spectacular as the Grand Canyon, Yosemite Valley, or the Redwoods. It's something we hope to see again in person, that's for sure. Here's a map of the end of the parade as it works it's way up Sierra Madre, with the two spots where we've viewed it. 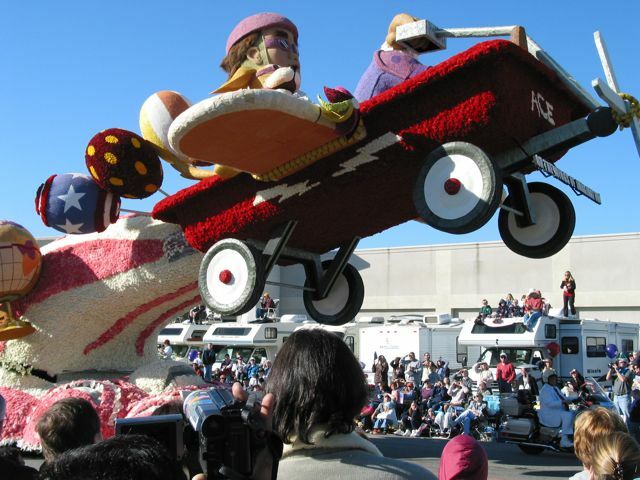 Remember, the Parade is never held on a Sunday, so this year's Parade will be held on Monday January 2nd. 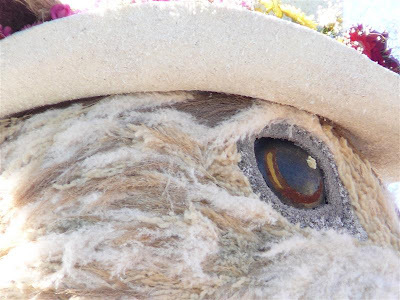 The weather forecast is 82° under sunny skies. Wow, nice. 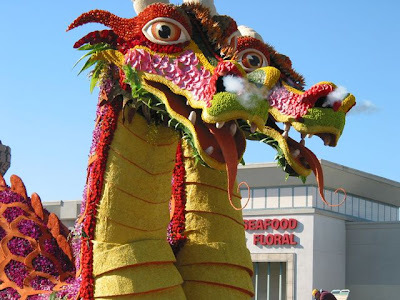 Here's a link to the Tournament of Roses website. first pic is esp good - there was a similar float again this year ... what would the rose parade be without a chinese dragon? 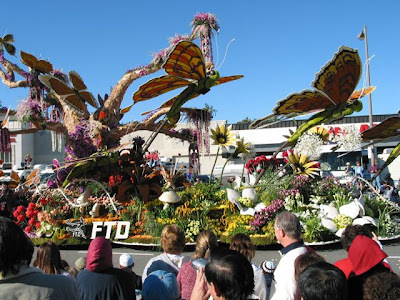 great post - but you might want to check your map - rose parade does NOT go on the freeway!